From time to time one of the hard disk drives (HDDs) in your Kobas EPoS server may fail. Failures are infrequent and rare so hopefully will never happen to you, but this guide is here in case it does. It answers some frequently asked questions and explains how to resolve the situation should the worst happen. It should be noted that this help guide is only relevant if you run a Dell EPoS server supplied by Kobas. In the event that you’ve chosen to have us perform an installation on a server not supplied by us, it won’t be compatible with our monitoring service and could fail completely without warning. How will I know if one of my hard drives fails? 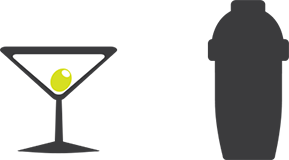 The first you’ll know about it will be a notification from our Kobas support team. You will still be able to use your Kobas EPoS while we work to replace your hard drive. Can I continue to trade if one of my hard drives fails? Yes. Your Kobas EPoS server has a pair of mirrored drives, so as long as you only suffer a single hard drive failure, everything will continue to work as normal. There may be a subtle performance drop but it probably won’t be noticeable unless you have a very large installation. The key thing is to ensure the failed hard drive is replaced as soon as possible. Can I continue to trade while my hard drive is replaced? Your Kobas EPoS server will need to be powered off while the hard drive is replaced, so expect to be unable to use your tills for up to 15 minutes while the disk swap operation takes place. What happens if I never replace the disk? All the time the other hard disk drive remains healthy your Kobas EPoS installation will continue to work. However if that drive subsequently fails, your Kobas EPoS installation will cease to function and you’ll require a site visit from an engineer to perform a server rebuild. For costs on this please see our pricing page. If your Kobas EPoS server has been with you for less than twelve months, there is no fee for the replacement hard disk drive. Otherwise there’s a £60 charge for a brand new hard disk drive. Under normal circumstances if you’re on the UK mainland we can get an engineer to your venue within two business days. If you’re within London’s zone 3 we can probably get to you the same day for £100, but our customers further afield take longer to reach. Our shared response service offers an engineer on site when their journey can next be shared with other obligations. It therefore comes with no commitment as to when that might be, but our support team should be able to advise you when you are notified of the disk failure. We can post you a replacement disk (costs listed above) and at your own risk, you can follow the guide that follows this answer. This fee includes postage and some remote engineering time to bring the new disk online once it is in the server. You’ll also need to post the failed disk back to us at our London depot. Press the power button on the front of your Kobas server. Within a minute the server should power off, extinguishing any green lights on the front. If this doesn’t work, press and hold the power button, but please avoid doing this unless really necessary. Then remove the power lead from the rear of the server. If you need to move the server you’ll also need to remove the ethernet (network) cable. Place the server on a clean, flat surface. Equip yourself with an antistatic wrist strap. 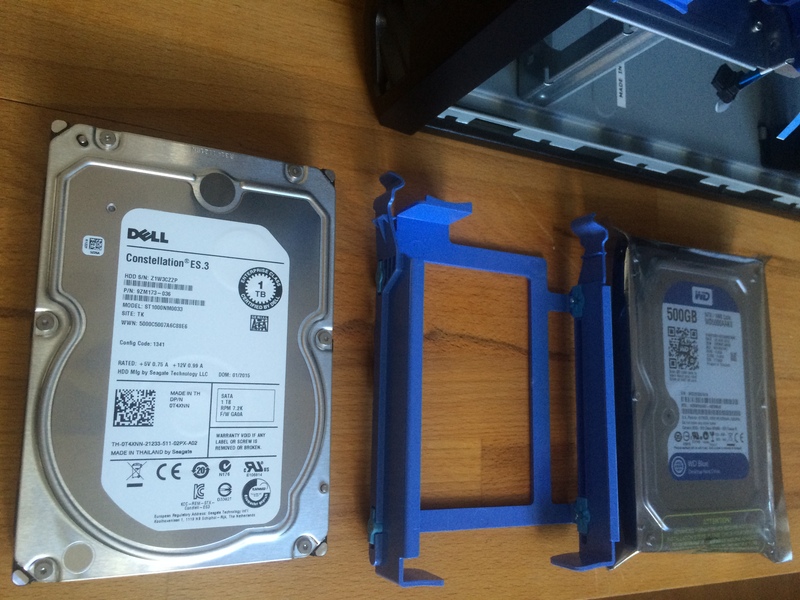 Methods of opening the case and identifying the disks varies on server model. 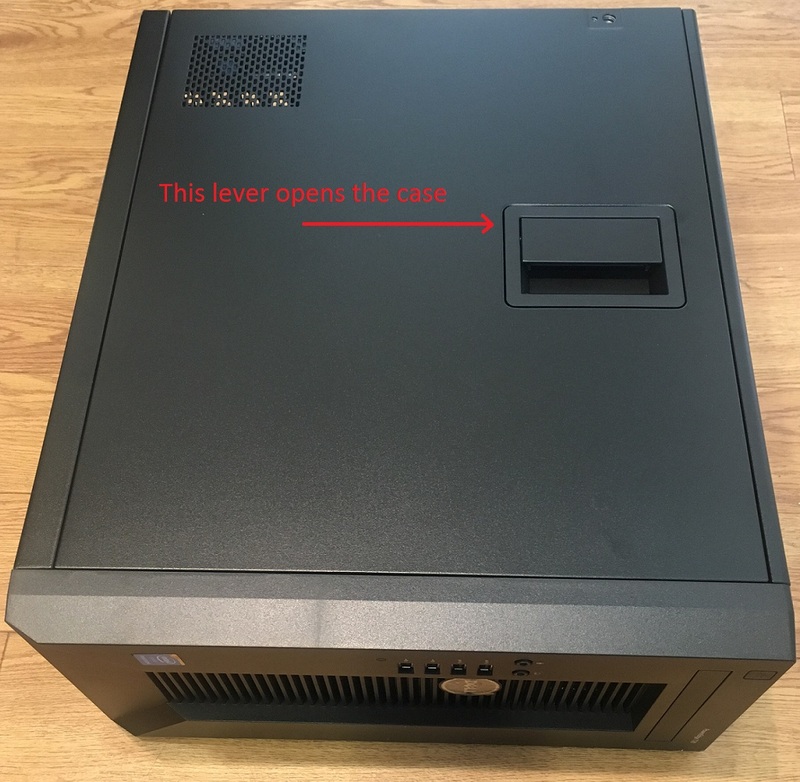 Open the case using the lever at the rear of the top of the case – see diagram below. You will have been told whether HDD 0 or HDD 1 has failed. 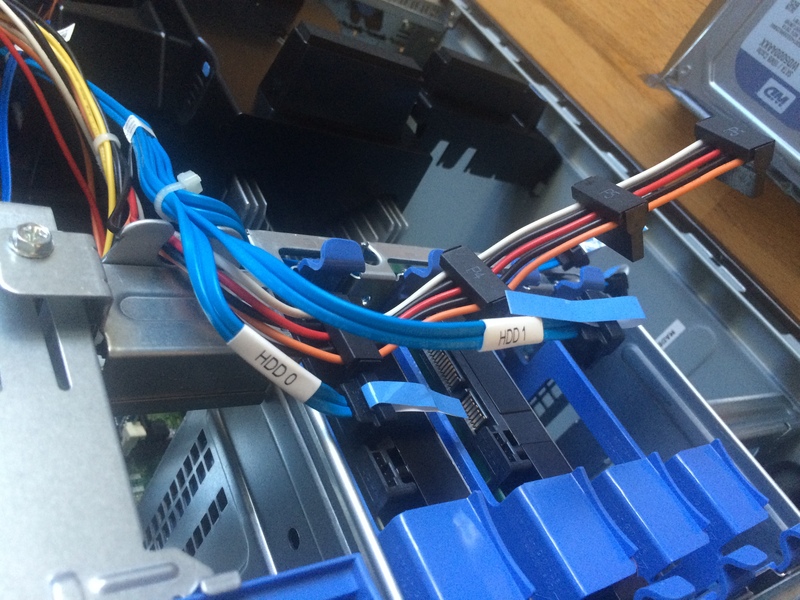 Remove both the connectors (one with blue and the with multi-coloured cables) from the failed HDD. The example below shows HDD 1 disconnected. Open the case using the lever on the side of the case – see diagram below. You will have been supplied the serial number of the faulty drive. Remove a drive and check for a match. If the serial number doesn’t match, replace the drive and check the other until you are sure you’ve removed the faulty drive. 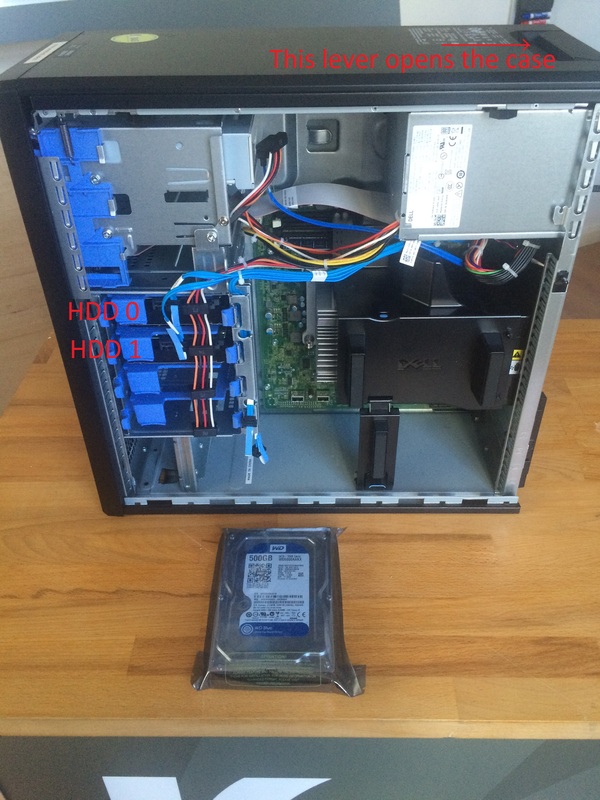 Place the new drive in the carrier, and pop the carrier back in the server. Firmly connect both black connectors to the new disk. 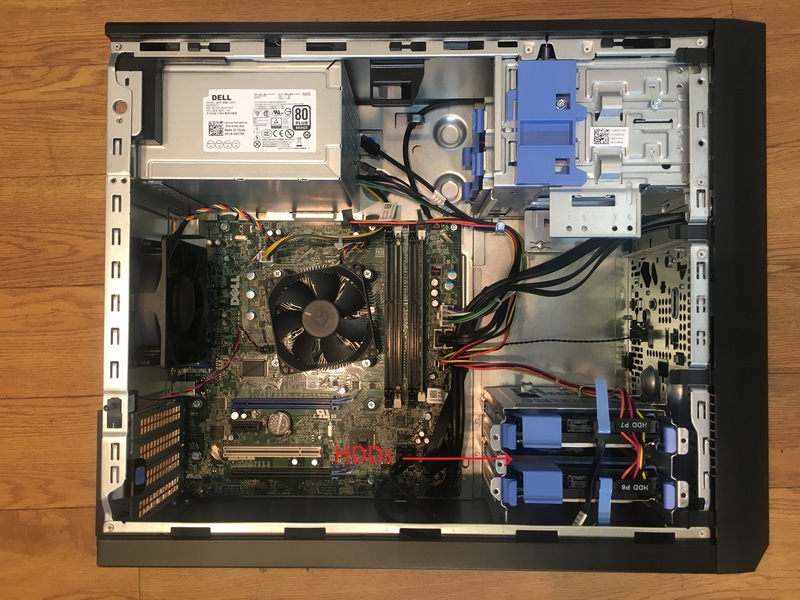 Refit the case cover, refit the ethernet and power cables, and power on your server. Finally, let our support team know you’re done and they’ll ensure the new drive obtains a copy of the server data and is pressed back into service.